Nearly three-quarters of shoppers in seven countries and a whopping 78% of U.S. shoppers think brands are using multiple channels — online, email, social media and in-store interactions — to boost sales rather than to improve customer service, according to a new global survey commissioned by Zendesk and performed by Loudhouse. Company reputations for good customer service matters to 84% of U.S. shoppers, compared with 78% in the other countries, while 71% of U.S. shoppers say that being rewarded for purchases, feedback and referrals is important to them. 37% of Americans say that good customer service will bring them, their dollars and referrals back to the company, compared to 33% in other countries. And most Americans surveyed (71%) said their expectations are increasing. When shoppers fail to resolve issues, they are likely to use the old-fashioned telephone to seek help, especially in the U.S., where 65% expect their problem to be resolved within 30 minutes of phoning customer service. Speedy responses and resolutions to problems are important to 88% of shoppers worldwide and in the U.S., yet only half the American respondents believe brands are “good” or “excellent” at meeting this expectation. Nearly half (45%) say they’d persist — try any means of communication, and wait as long as it takes to get things resolved. But customers 55 and older are more patient. Companies investing in multichannel ways of reaching customers may want to take a look at how easy it is for their customers to reach them, too. A good customer service experience can translate to a loyalty that brings repeat sales and brand “ambassadorship” that can’t be bought any other way. 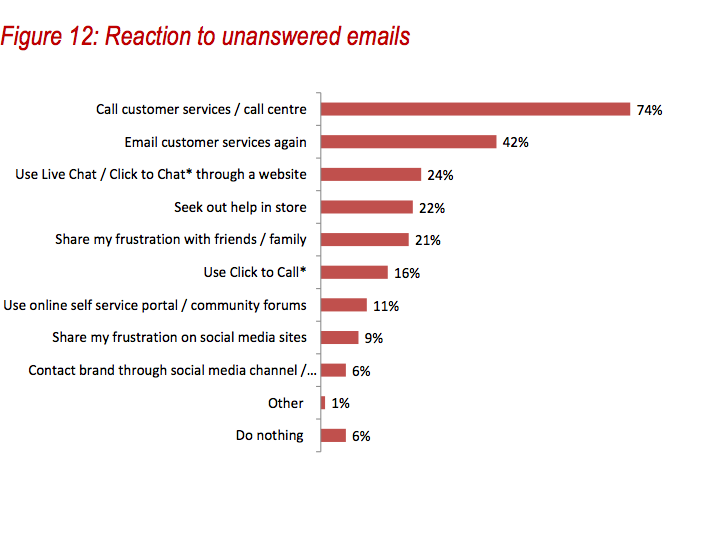 Yet this research by Loudhouse and Zendesk shows that consumers are increasingly disappointed by brands’ customer service. With younger shoppers particularly interested in speedy service no matter the channel, this costly gap can only get wider if left unchecked. And don’t unplug the phone. 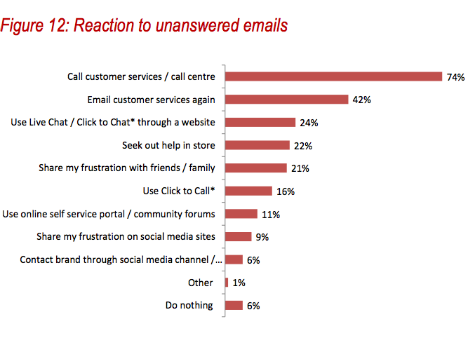 Whenever text-based or in-person customer service requests fail, you can expect a call.